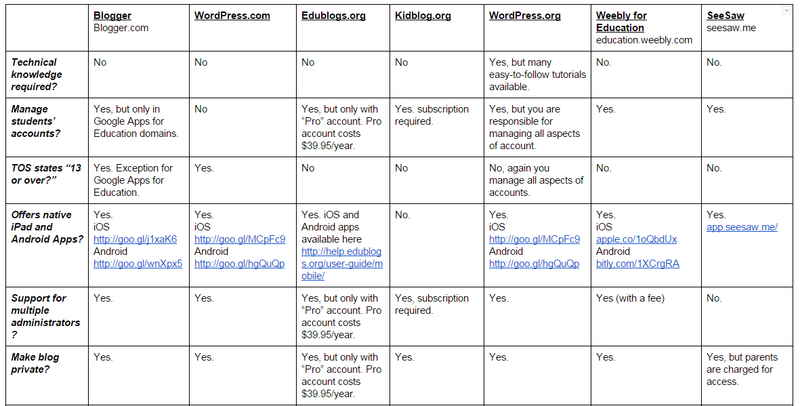 Last week I published an updated version of one my popular ed tech tools comparison charts. That chart was about creating multimedia quizzes. This afternoon I updated my chart of seven blogging tools for teachers. The chart is available as a Google Doc or as a PDF embedded below. Unlike some of my other charts, at the bottom of this one I included my ranking of the tools. That ranking is also written below the chart embedded into this post. 1. WordPress.org - If you have the technical accumen or the time to learn it (it’s not that hard), self-hosting a blog that runs on WordPress software will give you the ultimate in control and flexibility. You will be able to create and manage student accounts, have a nearly infinite variety of customizations, and you’ll be able to move your blog from server to server whenever you want to. That said, you will have to pay for hosting (or convince your school to give you server space) and you will be responsible for maintaining security updates and backing-up your blog regularly. 2. Blogger - It’s free and easy to set-up. It can be integrated into your Google Apps for Education account which means that you and your students can use the same usernames and passwords that they use in all other Google tools. You can make your blog private (up to 100 members invited by email). The drawback to it is that a lot of school filters flag it as “social media” and block it on those grounds. 3. Weebly for Education - It’s free to have up to 40 students in your account. You can manage your students’ accounts. You can have students contribute to a group blog and or let them manage their own individual blogs. 4. Edublogs or Kidblog - Both services allow you to manage your students’ accounts. Both require you to pay for a subscription in order to get the features that you really want. Those features include embedding videos and other media from third party sites. Both services are powered by WordPress. I give a slight edge to Edublog because they have proven, outstanding customer support. Edublogs also offers mobile apps while Kidblog does not. 5. SeeSaw.me - SeeSaw was originally launched as a digital portfolio tool. The addition of a blogging component was made in January 2016. The blogging component of SeeSaw allows you to import and display your students’ digital artifacts publicly or privately. There is not much you can do with SeeSaw in terms of customization of layout and color scheme. SeeSaw is free for teachers and students to use, but charges parents for access to see their students’ digital portfolios. 6. WordPress.com - It’s easy to use and is free, but with some serious limitations at the free level. The free version displays advertising on your blog which you cannot control. The free version also doesn’t allow embedding content from many third-party sites.